Canadian Real Estate Association (CREA) and five other major real estate boards including Toronto Real Estate Board have developed a new index to measure the trend in house prices and inflation in the housing market. There are a number of indices under MLS® HPI indices. This is similar to Consumer Price Index (CPI) that is a measure of consumer price inflation. The reference point is January 2005 and the base point of price is 100. More information and HPI Tool are on their MLS® Home Price Index web-site.Toronto Real Estate Board's (TREB) news release has the indices broken down for various regions. The above graphics is from TREB. The index for single family home in Toronto is 150.3. What does it mean? The market value of single family homes in Toronto has gone up 50.3% in the last seven years. This also means that price has gone up at an annual rate of 6% every year since January 2005! From the graphs given on the CREA news release the Trend for Toronto is in an upward direction. But, will the Trend continue upward? 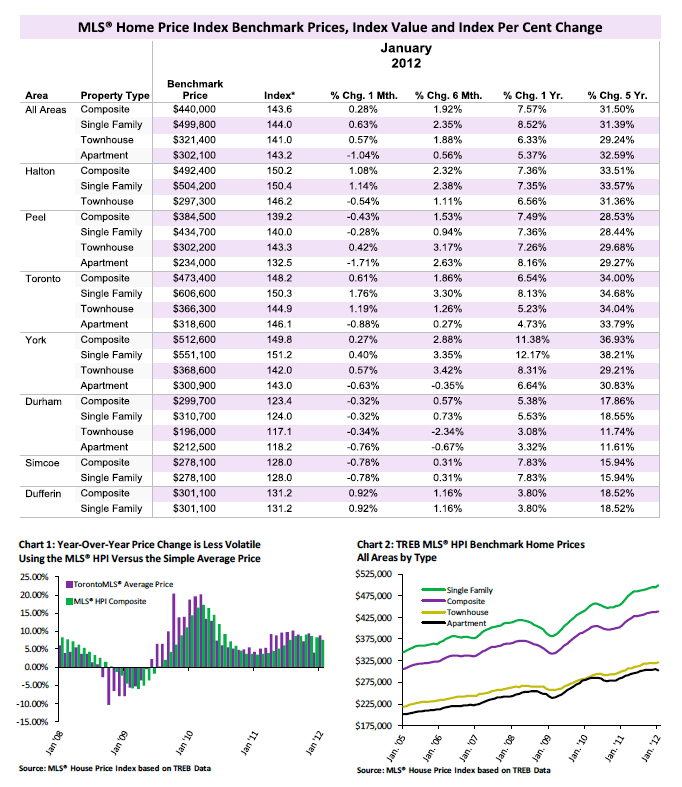 At least we will get good data from MLS® Home Price Index every month to analyze it.